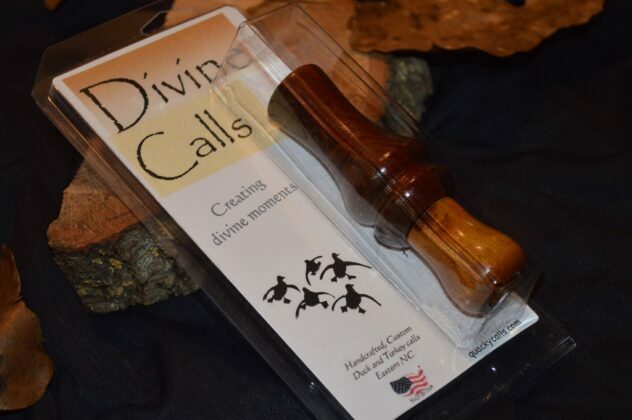 Divine Calls is a subsidiary of quackycalls, both owned by callmaker Chris Harrell and made to the same standards but with an element of christian faith covering and anointing. As a believer in Christ and God the Father of the Bible I understand my talents, abilities and speech can only be separated but so far from the Father. For in Him we move, live and have our being. He truly is the Father of all, creator of all and I’m connected to the earth, its biosphere, ecosystems and natural resources in depths which my human mind cannot fully conceive. This connection transcends any manipulation, mismanagement of man and even conditions created by those which blatantly disregard it. Making the world a more beautiful place and bringing elements of healing to our land, bodies and landscapes are pushes I feel deeply and strongly about. It’s important to share with the world, the little good and hope that I have to offer. That’s what Divine Calls is about. It’s about working within the scope of my talents in various realms with the hand of the Father and distributing the little good that I have to offer. We all have limits to our natural talents and are quite often constrained in our work lives yet the connection exists to work with God within the scope of our talents. There are seasons where we are stretched and gain new ground and footing towards expansions of our natural talents. It’s important to share our talents with others, work with God within the scope of these talents and make our world a more beautiful place. My heart and soul have always gone into every call I craft. However, I go one step further with Divine Calls; where the product of focus stems from from christian sight when a particular inspiration feeds my soul. Every call of this series is prayed over- blessed and anointed with God’s invisible but ever present Holy Spirit and asked that it’s new owner will experience divine moments in the wild. Moments which connect one’s soul with awe, inspiration and unique, memorable events while out in the bush. Each call, just as people, have their own design function and purpose. The majority of outdoorsmen know exactly what I’m referencing when speaking about divine moments in the bush. They are those moments when the connection with wild spaces reaches deep into one’s soul, shakes and stirs us….unique experiences unfold and that epiphany strikes you rigidly. We are left standing at awe! That is my prayer and that’s the anointing that covers these particular calls. Divine Calls creating divine moments.